Ever since they started running the shuttle from downtown Baltimore out to UMBC I’ve just been taking that commute rather than taking the Brompton on the MARC train like I did last year–the shuttle’s free and easy, and I get to stretch my legs on the Surly, still my very favorite ride. It’s strange–I used to take that bike out almost every day, but now she sits quietly in the dining room collecting dust in between rides. But then it’s a Friday during October baseball, and the last thing I want to do is get caught in downtown traffic–the shuttle may feel like magic, but it’s just as prone to get caught in the cars as any other vehicle. Solution? Take Brompty on MARC like the good old days, so that’s what I did–easy peasy, the bike getting her own seat at the front of the train. Multimodal commute options FTW! And coming back into Penn Station in the afternoon made it easy for N. to pick us all up and take us home. I really never ever miss having a car–there are so many options out there that make owning my own car unnecessary. Lucky me. Could that be you too? 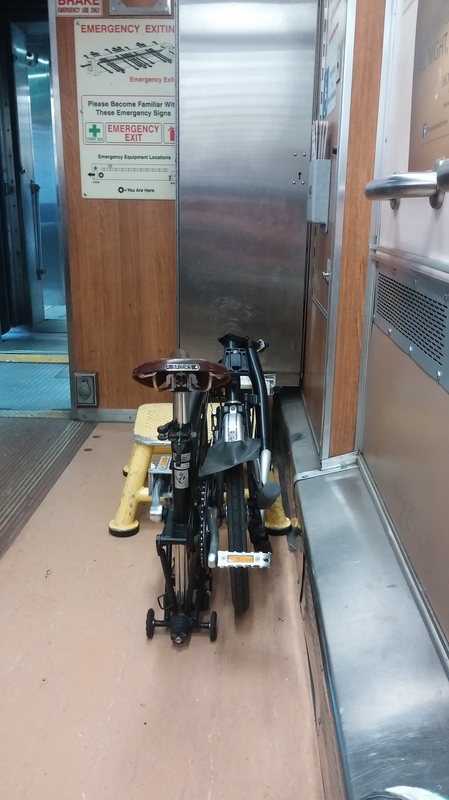 This entry was posted in bikes, commuting and tagged Brompton, Brompty, commuting, MARC. Bookmark the permalink. God, that’s a cool looking bike.